Recently I tried deleting few resource groups(RG) having AKS cluster with ACI enabled. I couldn’t get them deleted completely for some reason leaving Vnet all those RG’s. Error message was “Failed to delete virtual network ‘k8s-vkdemo-2-vnet’. Error: Subnet virtual-node-aci is in use by and cannot be deleted.” I got the same error for other 2 cluster RG as well. I tried deleting individual sub-nets there I got an error. With help of support and this article I was able to delete the RG. It’s is documented here -> https://docs.microsoft.com/en-us/azure/container-instances/container-instances-vnet#delete-network-resources. Here is the revised script. – deploy a managed Kubernetes cluster in Azure. – handles critical tasks like health monitoring and maintenance for you. – masters are managed by Azure and You only manage and maintain the agent nodes. > For integration with existing virtual networks or on-premises networks, use advanced networking in AKS. 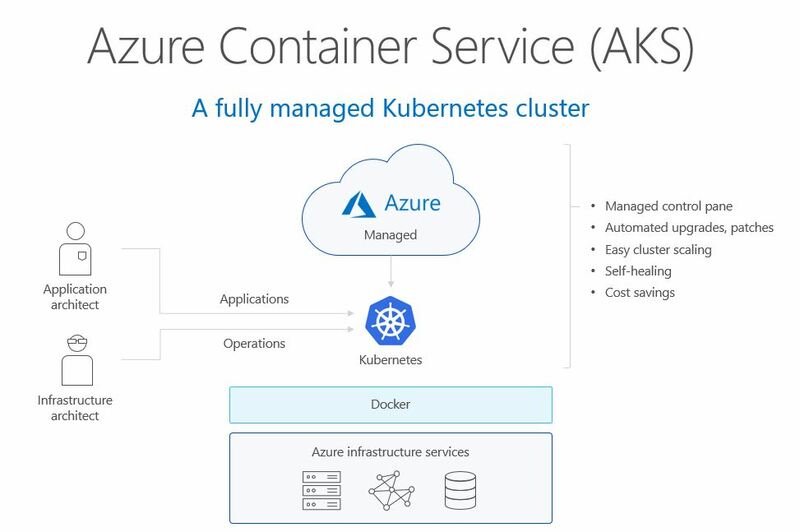 + Basic networking – Azure manages the virtual network resources as the cluster is deployed and uses the kubenet Kubernetes plugin. + Advanced networking – Deploys into an existing virtual network, and uses the Azure Container Networking Interface (CNI) Kubernetes plugin. Pods receive individual IPs that can route to other network services or on-premises resources. Merged “myCluster” as current context ..
Accessing your Kubernetes dashboard through proxy you might experience this warning. Resolution: From the message it is apparent that, access to the dashboard is restricted. Solution is to add the required rolebinding as below. Two ways to do it. You can create the binding with simple one liner from CLI or YAML way. or YAML way to create the role binding. Create the below Yaml file with some name say “dashboard-rolebinding.yaml” and submit for creation in the same Kubectl. PS- I had this experience when I access my AKS cluster, so not sure about other providers or distribution at this time of writing. Sample question: How to create a RAID 5 Device using 3 disk device of 1 GB each. Also allocate additional device as spare device. Before 1990, its was all CLI. Every software had commands & parameters. That was the standard of the Software development. Post that we had GUI based interfaces having buttons and mouse clicks. Around 1995, we had Internet Web UI as became the standard. After the success of smart phones in 2008, we saw more Responsive UI developed using jQuery,Bootstrap and now we live in the era of Conversation UI. Bots like Cortana, Siri, Alexa are around the block to help our modern needs. Below is the snippet which I borrowed from this ebook covering “how the enterprise information technology has transformed over the last few decades”. Thanks to the author who put the classification beautifully with examples. Client-Server Revolution → Systems of records It was the client-server revolution that first enabled broad use of information technology to manage business. Organizations first built systems of records: Customer Relationship Management (CRM) systems; Human Capital Management (HCM) systems for HR; and Enterprise Resource Planning (ERP) systems for financials and key assets. Internet Revolution → System of engagement The rise of the internet, mobile, and chat allowed us to create systems of engagement that interfaced between the systems of records and interacted directly with customers and suppliers. AI Revolution → System of intelligence What is emerging now are systems of intelligence that integrate data across all systems of record, connect directly to systems of engagement, and build systems that understand and reason with the data. These systems can drive workflows and management processes, optimize operations, and drive intelligent interactions with customers, employees, suppliers, and stakeholders. Below is our Microsoft AI platform story covered in one slide deck. 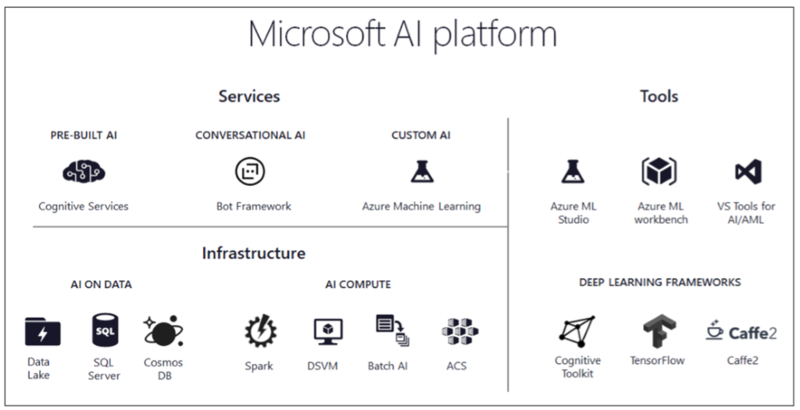 Azure AI -> A page where our Microsoft AI story is well articulated (In the page, scroll down for ‘AI Services’). Conference Buddy –> ingredients needed to develop an intelligent chatbot. sample code for try one.